This is a simple MaxforLive tool that enables you to send out Program Change information. It has midi mappable Up, Down buttons and Knob. 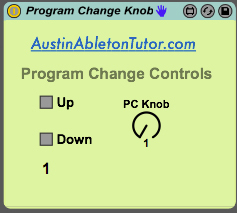 You can also use Clip and Track Automation to move the knob in your Ableton Live Set. Check out these videos about using Clips to send program change to Traktor and Massive. Basically, instead of using the Program Change functions within a midi clip, you can use Clip or Track Automation to change presets. This is handy if you want to launch 1 clip and have the presets change over time.